This only sabotages future success. College courses are demanding, and students who avoid challenging college prep classes probably won’t have the knowledge to be admitted to four-year colleges. They may find themselves relegated to several years of remedial courses at a community college in order to catch up; this only makes things more difficult, as they’ll have only 15 weeks, versus a year in high school, to conquer a tough subject. If your child’s disability makes learning a foreign language nearly impossible, talk to a counselor about possible substitutions, such as American Sign Language or cultural classes. Many colleges now acknowledge this hardship for students with language-based disabilities and accept other courses to fulfill their language requirement. While parents are often tempted to rescue their child when things go awry, keep in mind that you can’t follow your kid to college. Beginning in middle school, gradually pull back, allowing your child to learn from her mistakes. Stop running to school with assignments she left home. Avoid reminding her of due dates. Instead, teachyour child strategies for remembering, such as hanging brightly-colored Post-It notes in prominent places. If she messes up, use the mistake as a teaching opportunity. Discuss what went wrong and how to avoid it next time. Beginning in middle school, students should play an ever-increasing role in their IEP meetings, with the goal of leading the meetings by the time high school rolls around. The benefits of this are threefold: your child will become thoroughly familiar with his disability; he will understand the accommodations he needs to succeed; and he will become adept at self-advocacy. All three benefits play a role in college success. Throw out the assignment pad! Encourage your child to use an academic monthly/weekly planner as early as middle school to keep track of assignments. Show him how to break long-term assignments into smaller parts and record deadlines for each step. 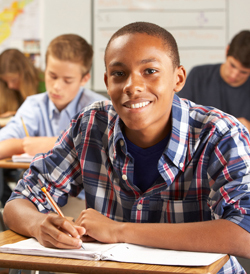 In middle school, your child should begin to develop study skills that will serve her well in college. These include learning how to extract the main ideas and supporting details from assigned readings, and taking notes that will serve as a study guide. In college, the quantity of assigned reading makes re-reading prior to an exam impractical, yet it’s something many students do routinely, with unsuccessful results. She should learn to vary her study methods and use as many senses as possible to stay engaged. Most important (but perhaps hardest) is to avoid cramming. Although it might work in high school, it won’t be effective with the large volume of material one must study in college. Practice spaced studying. Short, frequent study sessions are vital for getting information into long-term memory where it can be easily retrieved for exams. There is a science to test-taking, and while it is not a substitute for studying the material, learning the “tricks”to taking multiple choice, true/false, fill-in-the-blank, and essay exams can improve your child’s results. Help your child change his attitude. He needs to view seeking help as a positive character trait rather than a weakness. Students who seek out tutors, make appointments with teachers, and enlist the help of competent classmates when confused are often the most successful. Because the pace is so much faster in college, students must get clarification at the first sign of confusion, or they may soon find themselves in academic quicksand! Colleges like students who are well-rounded and have made a significant contribution to their school or community. It’s never too early to get involved. Colleges prefer steady involvement in one or two activities rather than spreading oneself thin in several. It always surprises me that in this high-tech age, where cell phones and iPads have practically become extra appendages, so few students take advantage of technology to compensate for their learning deficits. In fact, technology can be an enormous help in leveling the playing field for students. Below are some examples of technology to make your academic life easier. By starting to prepare early for college, students can gradually improve the requisite skills for college success and make transition a far less stressful, smoother experience. Students who are comfortable with technology prior to college have a distinct advantage upon transition. Live Scribe Smartpen: An excellent tool for poor note-takers. Writing tool: For students who have trouble putting words to paper, Dragon's Naturally Speaking 12 is the world's leading speech recognition software, which may make an arduous task less frustrating and time-consuming. Microsoft AutoSummarize: Identifies key points in well-structured documents such as reports and scientific articles.